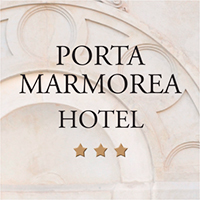 HOTEL PORTA MARMOREA is located in the Medieval old town of Gubbio, a unique and special place. famous “Race of Ceri” (“Corsa dei Ceri”), every year 15th May. Every room has a lockbox, TV, telephone, Wi-Fi, hairdryer, minibar. A homey breakfast room will provide you with a happy awakening. The breakfast is from 7.30 a.m. to 9.30 a.m.
We remind you that the economy rooms are located on the ground floor and the comfort rooms are on the first and second floor. We also remember you that the small and medium-sized dogs are allowed for free, but can not access the breakfast room. Price from 65 € (including breakfast and daily cleaning service). Our standard rooms are intimate and very bright. They are furnished with wrought-iron beds, according to the local tradition. The furniture is often inside the wall as people used to do to save space in the olden days. 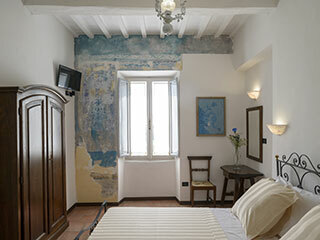 All rooms are equipped with private bathroom with shower and hairdryer. Rooms overlook the ancient city walls. From the upper floors you can see the plain called “la piana di Gubbio”. bright. They are furnished with wrought-iron beds and minimal furniture in order to follow the typically classic way we used to furnish the houses. The wall paintings contribute to create this ancient atmosphere. A well – known local artist has made all the paintings. He has wanted to realise the typical frescoes of the old houses and palaces. Gubbio, the “the city of stone”, since it is at the highest point of the palace. Mountain’s side where the old town lays. You can also admire palaces, churches, convents, bell towers and the famous “Palazzo dei Consoli” with its austere majesty dominating all the landscape. 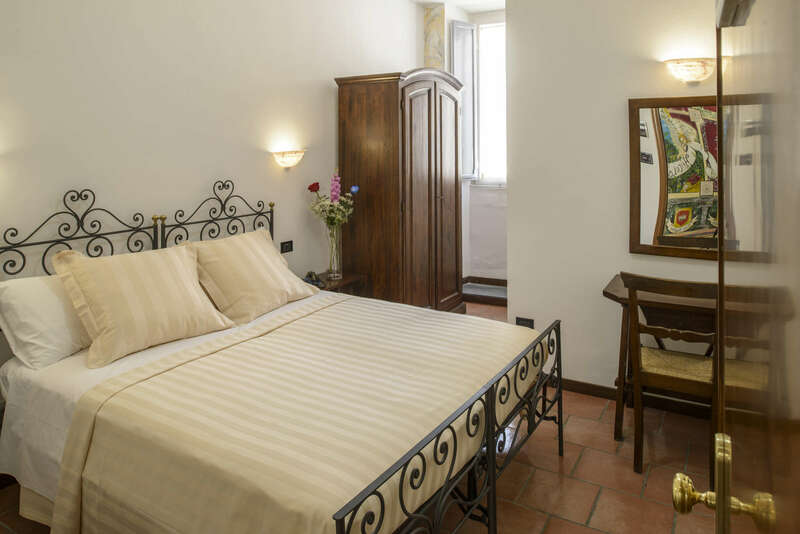 The room has frescoes on the walls and minimal furniture following Gubbio’s art style that distinguishes all the building. Our room with a view is even more magical during the Christmas time because of the lighting of the biggest Christmas tree in the world. It is a front row sea to this great show.